On August 21, 2017, North America is in for a major treat. Starting on the western seaboard the shadow of the Moon will begin sweeping across the continent and blocking out at least a portion of the Sun for North Americans, which is in and of itself a pretty unique spectacle; however, a swath of the United States is also in the path of totality and will have opportunity to see the Sun completely blocked for up to 2 minutes and 42 seconds – a total solar eclipse. Nashville, Tennessee is the largest city in the path of totality. Though Vanderbilt Dyer Observatory will not be holding a viewing of the eclipse due to limited space and very limited time in the path of totality, we are working with Nashville groups to engage and educate the public about the eclipse, including safe viewing of the event. Eclipses – Why Do They Occur? Solar eclipses are fairly common – there are typically two solar eclipses per year occurring somewhere on Earth. Most folks will witness at least one partial solar eclipse in their lifetimes; however, most folks who aren’t avid amateur astronomers will not witness one of the true splendors of nature – a total solar eclipse. An eclipse occurs when one body passes in front of and obscures another body. In general, an eclipse typically refers to the Sun being blocked by the Moon (a solar eclipse) or the Earth blocking the Sun (a lunar eclipse). In order for this to occur, the three bodies (Sun, Moon, and Earth) have to be in a nearly perfectly straight line. As a result, a solar eclipse can only occur during New Moon and a lunar eclipse can only occur during Full Moon. These two moon phases occur every month, so why don’t we have solar and lunar eclipses each month? The answer lies in the Moon’s orbit. Let’s imagine that the Earth is stationary and the Sun and Moon both orbit our planet. From our viewpoint here on Earth that is how things appear. (This helped give rise to and support the geocentric “Earth-centered” model of the solar system that, up until a couple of hundred years ago, was widely accepted by many as the correct view of our universe.) From our viewpoint on Earth, the Sun appears to follow a specific path in the sky through the zodiac constellations, and this path is known as the ecliptic. For the moment, imagine this path as a hula hoop with the Earth at the center. The Moon does orbit the Earth, so now imagine its path as yet another hula circling the Earth. These hula hoops, however, do not lie in the same plane – the Moon’s orbit is tilted by a little over five degrees to the ecliptic. Now imagine these hula hoops together, one sitting inside the other, with one tilted a bit with respect to one another. As the Moon reaches new moon phase or even full moon phase, it will typically appear above or below the Sun in our sky – there is no eclipse. Approximately every six months though, the Moon and the Sun are found near one of the nodes – the points where the Moon’s orbit and the ecliptic intersect in our sky. This means that the Sun, Earth, and Moon lie in a straight line and an eclipse can occur. Most viewers of a solar eclipse will not get the opportunity to witness the grandeur of a total solar eclipse because of the narrow strip of totality. As shown in the figure at the top of this page, the Moon casts two shadows – a lighter, outer shadow known as the penumbra and a darker, inner shadow known as the umbra. From the viewpoint of the Moon, the Earth would be in a full phase and a noticeable shadow would sweep cross our planet in a matter of a couple of hours. The above animation is a sequence of images from NASA’s Deep Space Climate Observatory (DISCOVR) taken on March 9, 2016 during a total solar eclipse. The shadow of the Moon is clearly seen traversing the Indian and Pacific Oceans. Much of the visible shadow is the inner part of the Moon’s penumbra, and the darkest inner portion of the shadow, where observers witnessed totality, is the Moon’s umbra. Credit: NASA Earth Observatory; Animation by Joshua Stevens. Eclipse viewers located in the larger penumbra shadow will only witness a partial solar eclipse. As the Moon glides along its orbit, a portion of the Sun, anywhere from a little less than 1% to approximately 99.9% will be blocked. The degree to which the Sun is obscured by the Moon during a partial solar eclipse depends on the observer’s location on the Earth. The closer to the umbra (the darker, inner shadow of the Moon), the more of the Sun that is obscured and the longer the partial eclipse. 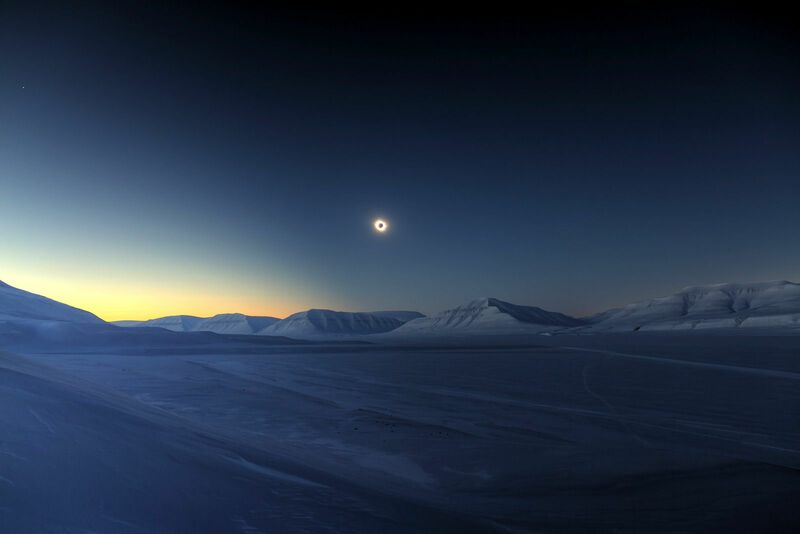 If the Moon, Sun, and Earth are in a good position with respect to one another, then a privileged few will witness a truly spectacular eclipse – a total solar eclipse. In order to view this event, one has to be in the umbra shadow of the Moon. As shown in the animation below, the contact point of the Moon’s cone-shaped umbra is extremely small, resulting in a very narrow path of totality. The distance of the Moon from Earth. The closer the Moon is, the larger it will appear in our sky, and the longer it will be able to cover the Sun. If the Moon is near its farthest point from Earth (apogee), totality is not possible because the Moon is too small to completely cover the Sun. The distance of the Earth from the Sun. The farther Earth is from the Sun, the smaller it will appear, and the easier it will be for the Moon to cover the solar disk. The location of the observer in the umbra. If one is near the center of the path of totality, the widest part of the shadow passes over and totality is longer. If one is near the edge of totality, then there may be only a few seconds of total eclipse. Also, if one is near where the umbra shadow just comes into contact with the Earth, totality will be very short due to the shadow racing over the curved surface of the planet. Once totality is achieved, many splendors can be observed. What Can Be Observed During a Solar Eclipse? 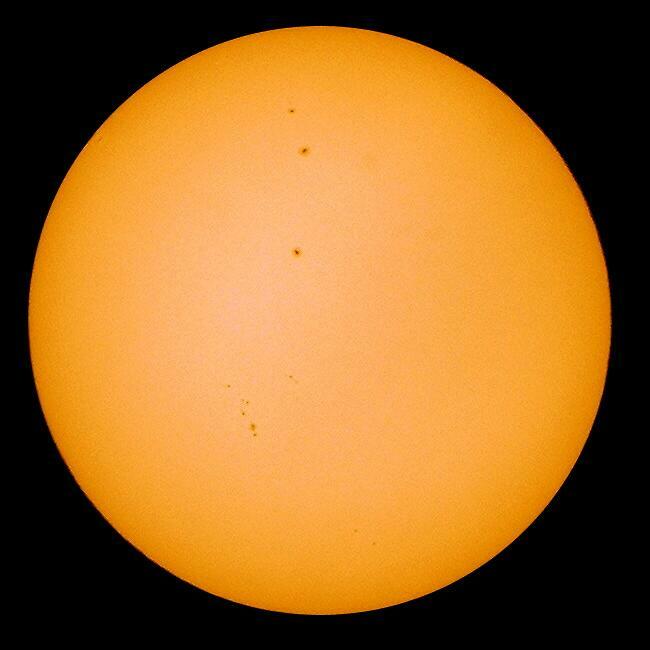 When the solar disk is obscured, previously invisible features can become apparent. The most spectacular feature is the solar corona – the outer atmosphere of the Sun. Resembling bright, ghostly wisps, the corona consists of gas glowing at a temperature of one- to two-million degrees Celsius. Closer inspection of the corona will reveal structure in this very tenuous gas. The Sun’s magnetic field attracts the hot, charged gas, which in turn outlines the complicated structure of the solar magnetic field. 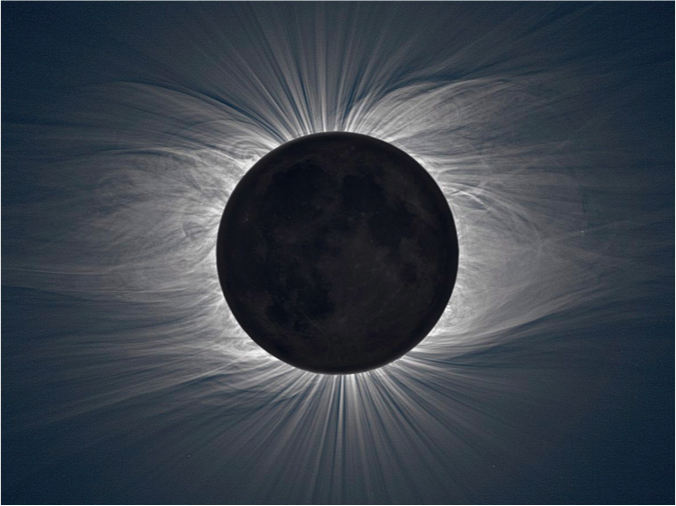 During totality, one should not try to observe the solar corona with an unfiltered telescope. Though the corona is not bright enough to cause eye damage, the sudden reappearance of the Sun’s disk to the unsuspecting observer can cause irreparable eye damage. In addition, the telescopic views will not be significantly better than naked-eye observations. One may also see some hints of red along the silhouette of the Moon, which may be one of two things. Some folks may observe that part of the edge of the Moon looks like it is highlighted by a very thin, deep-red crescent. This glowing red feature is the lower portion of the Sun’s atmosphere, which is known as the chromosphere. 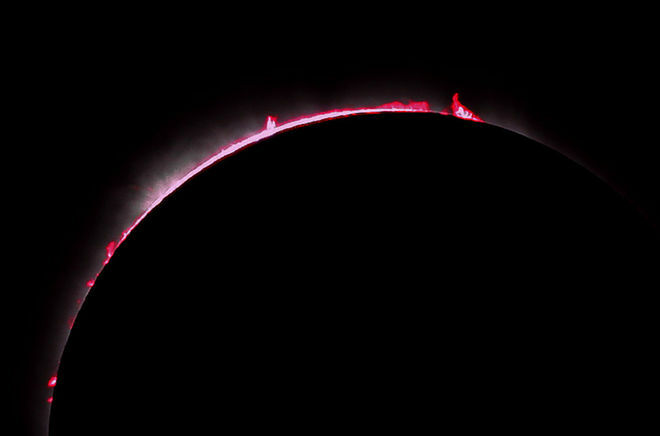 Named for its stark coloration, the chromosphere is approximately 10,000 degrees Celsius and is comprised of hydrogen gas emitting its distinctive red color. Others may notice some individual red blobs along the edge of the Moon, some of which may look detached from the lunar limb. These are prominences – large clouds of gas that are held in place by the Sun’s magnetic field. Though the prominences may look small, they can sometimes be tens of times the width of our fair planet! Bailey’s Beads are named after english astronomer Francis Baily who is credited as the first person to describe them after seeing an annular eclipse in 1836. The beads are due to the irregularities on the Moon’s surface that allow slight portions of the Sun’s surface (the photosphere) to shine through. The beads are typically most visible along the edge of the path of totality but can sometimes be observed in the few seconds before and after totality. 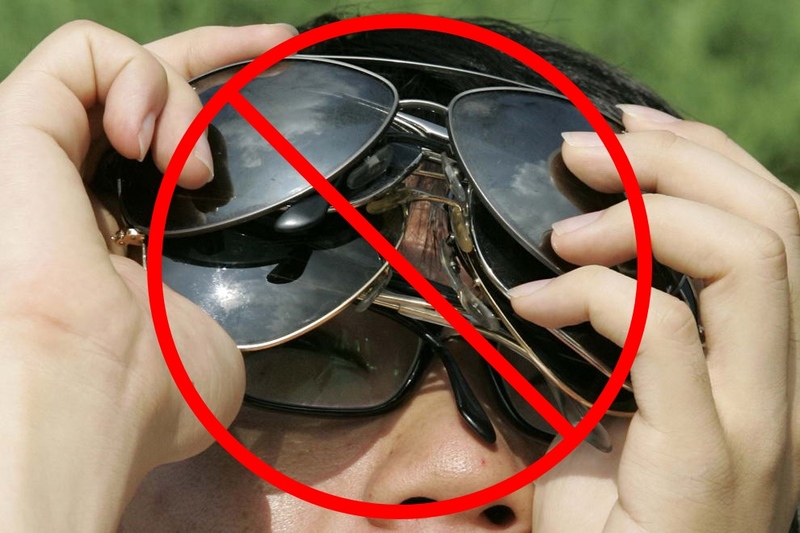 NOTE: Direct solar observation without proper eye protection should NOT be done when ANY of the beads are visible. 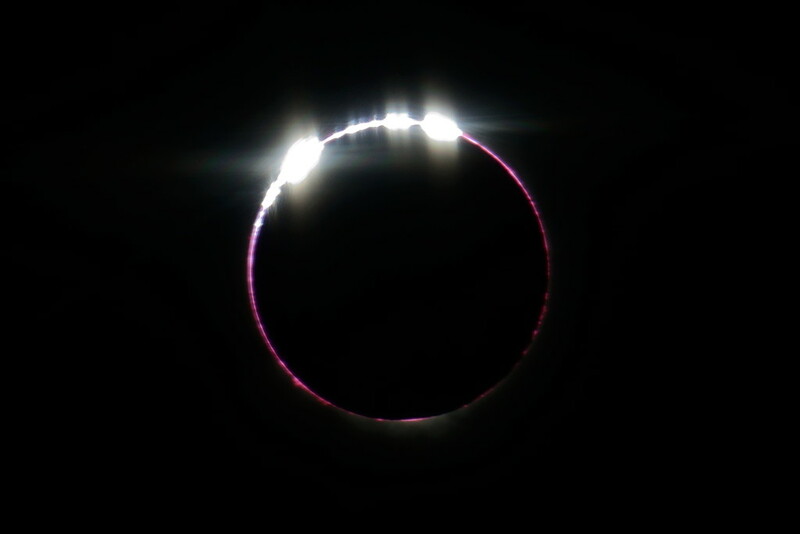 The Diamond Ring effect occurs during the few seconds before and after totality while an extremely small fraction of the Sun’s photosphere is still visible. The solar eclipse of August 21st, 2017 will be the first solar eclipse to cross the entire continental United States in over a century. 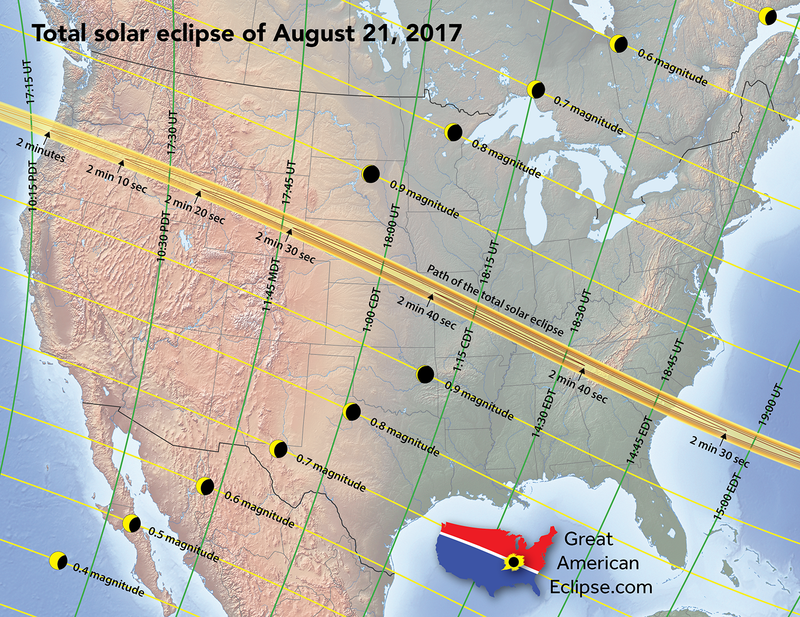 The entire continental U.S. will have the opportunity to view at least a partial solar eclipse, and people within a narrow (~100 mile wide) path stretching from seaboard to seaboard will have the privilege of witnessing a total solar eclipse. Approximately 11:58 a.m. CDT – First Contact. The Moon begins to move in front of the Sun (partial eclipse begins). Approximately 1:28 p.m. CDT – Totality. For nearly two minutes the Sun is completely obscured by the Moon (total eclipse begins). Approximately 2:54 p.m. CDT – Fourth Contact. 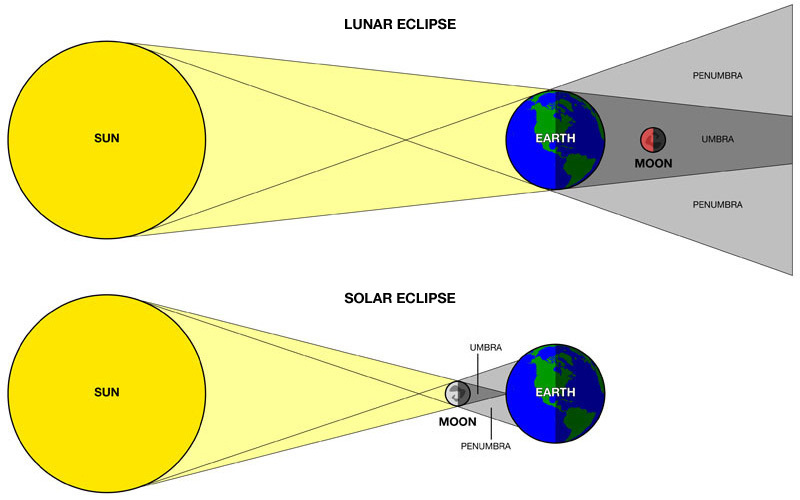 The last portion of the Moon moves out from in front of the Sun (partial eclipse ends). More information about the contact points and what you can expect to see during each of them can be found that the Exploratorium’s Solar Eclipse Page. This eclipse will offer some spectators (especially a bit north of Nashville) who are directly in the center of the path of totality up to 2 minutes and 42 seconds of dusk-like darkness. During this period, numerous bright stars will be visible, including some well known constellations and asterisms like Orion, Gemini, and the Big Dipper. 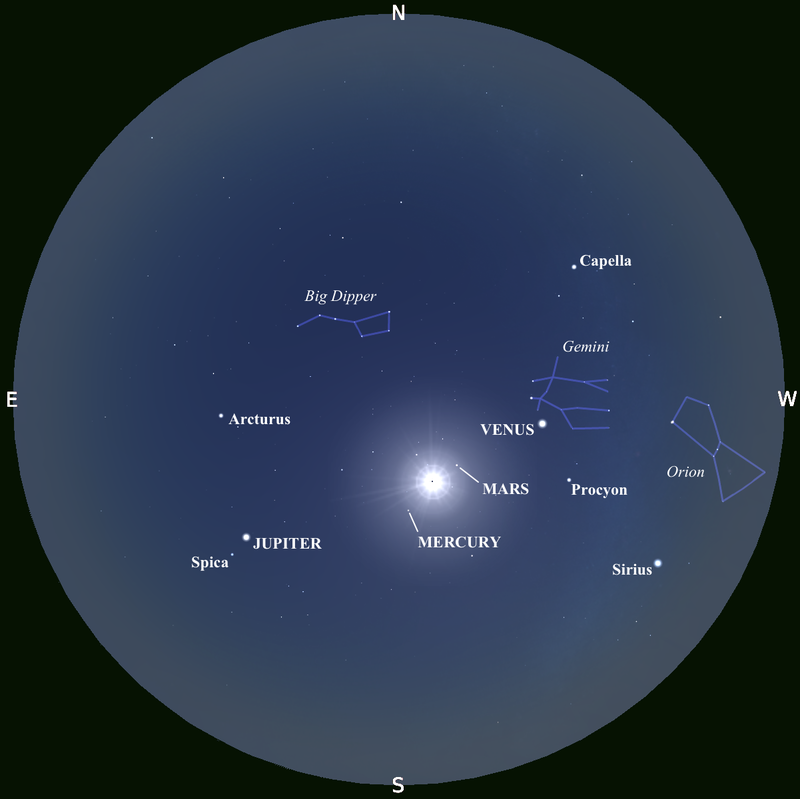 The planets Jupiter and Venus will be easily spotted halfway up in the eastern and western skies, respectively, while fainter Mars and Mercury will be on either side of the eclipsed Sun. There are now numerous websites devoted to the upcoming August 2017 solar eclipse. These pages contain information about eclipses, specifics about the August 2017 eclipse including maps, timings, etc. You can also learn more about what to expect to see during the solar eclipse and view numerous multimedia files. 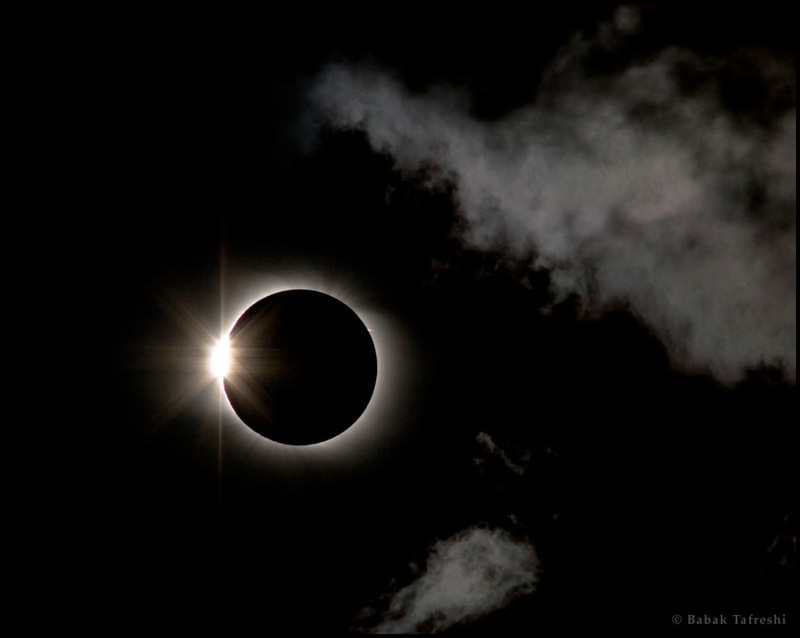 Vanderbilt University’s Eclipse Website – Learn about what Vanderbilt University is doing in celebration of the total solar eclipse. On eclipse day, this page will also include a live stream link from a camera mounted on a high-altitude weather ballon that will be released from Vanderbilt University. NASA’s eclipse website – also contains information about past and future eclipses of all types. Middle Tennessee State University’s Eclipse Page – includes information about activities being held at the MTSU campus. Interactive Google Map for Totality – an interactive Google map that shows the path of totality and also calculates the start and stop times of the partial and total eclipse phases as well as the duration of totality. Once you find your area of interest and zoom in, click on the location to view the information window. Xavier Jubier’s Interactive Google Map for the 2017 Solar Eclipse – an interactive Google map that shows the path of totality and also calculates the start and stop times of the partial and total eclipse phases as well as the duration of totality. Once you find your area of interest and zoom in, click on the location to view the information window. This map also allows you to type in an address to find the above information. After reading through the page, scroll down to the bottom to get to the map link. Solar eclipses are visible from somewhere on Earth approximately two times a year. Below are a couple of graphics illustrating the paths of total, partial, and annular solar eclipses through the year 2040. 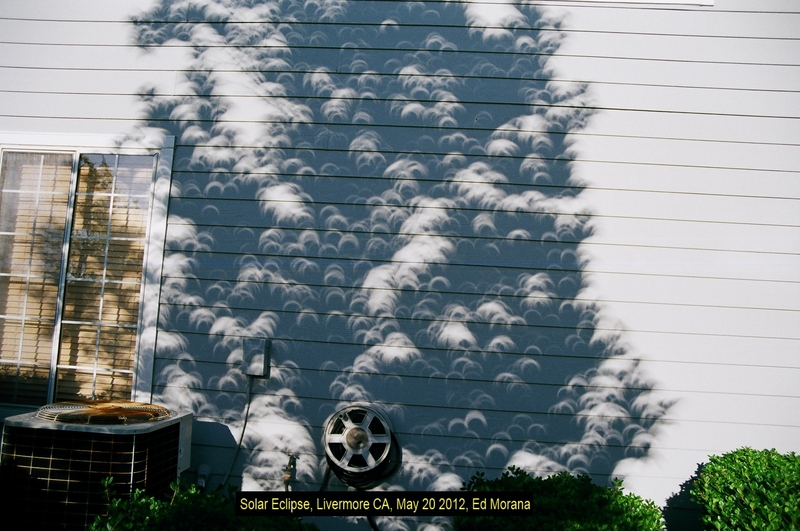 Note that observers around paths of annular and total eclipses can still observe a partial eclipses. Paths of total, hybrid, and annular solar eclipses from 2001 to 2020. Click on the image to enlarge to full resolution. Paths of total, partial, and annular solar eclipses from 2021 to 2040. Click on the image to enlarge to full resolution. The most important factor to consider when observing any solar eclipse is solar safety. For most, if not all, of a solar eclipse at least a portion of the Sun’s photosphere is visible. Even a small fraction of a percent of the Sun’s photosphere emits enough infrared and ultraviolet light to permanently damage your eyes in a very short period of time. YOU MUST ENSURE THAT THE PROPER TECHNIQUES AND EQUIPMENT ARE USED TO SAFELY VIEW A SOLAR ECLIPSE. CARELESS OBSERVATION CAN RESULT IN EYE DAMAGE AND EVEN BLINDNESS! During partial eclipse, when even the tiniest fraction of the Sun’s surface is visible, PROPER EYE PROTECTION MUST BE WORN! Below you will find information about different types of equipment and techniques that can be used for safe solar viewing as well as how NOT to view the Sun. These inexpensive glasses (usually around $1-$4 depending on how many you get) are the most common type of eye protection for viewing solar eclipses or the Sun in general. The lenses are made of a “black polymer” material or a silvery mylar that blocks 100% of ultraviolet and infrared light and only transmits about one-millionth of the Sun’s visible light. You will notice that you cannot see anything except the Sun when the glasses are worn, so it is not advisable to walk around while wearing them. If regular prescription glasses are worn, one can wear these over the normal glasses, though this might require the user to hold the stems on the ears. The main difference between the two types of solar glasses is the color of the Sun – the black polymer glasses give an orange view of the Sun while the mylar glasses make the Sun appear bluish-white. One should take care to protect the lenses of the solar glasses. The lens material, while pretty durable, can be damaged if handled roughly or accidentally stepped on. If one holds the glasses up to a bright light, such as a reading lamp, and light penetrates through tiny pinholes or scratches that have developed, the glasses should be discarded. Eclipse glasses are intended to be used by themselves. 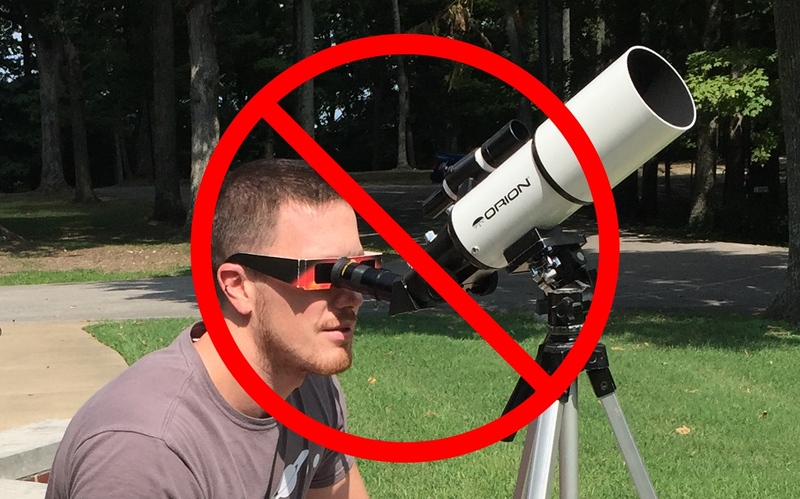 YOU MUST NEVER WEAR ECLIPSE GLASSES AND THEN LOOK AT THE SUN WITH AN UNFILTERED TELESCOPE OR BINOCULARS! Sunlight entering an unfiltered telescope or binoculars will be concentrated and literally burn through the solar glasses and then your eyes! Where Can You Buy Solar Glasses? Rainbow Symphony – a leading supplier of solar eclipse glasses. The products offered come in many styles. Bulk discount pricing is offered. Eclipse 2017.org – a supplier of eclipse glasses made by the Rainbow Symphony company. Bulk discount pricing is offered. 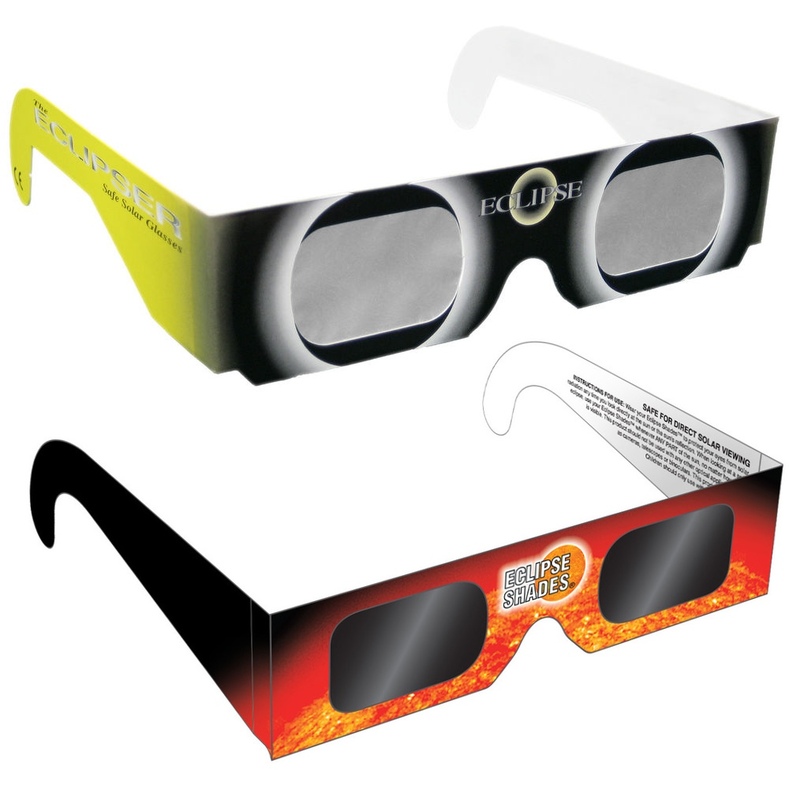 The glasses use the black polymer material, which provide an orange image of the Sun. If solar glasses are unavailable, a shade 14 or darker (higher number) welding glass is also suitable for solar viewing. These welding glasses also filter the UV and IR light and transmit only a minute amount of visible light. Typical welding glass will make the Sun appear green. 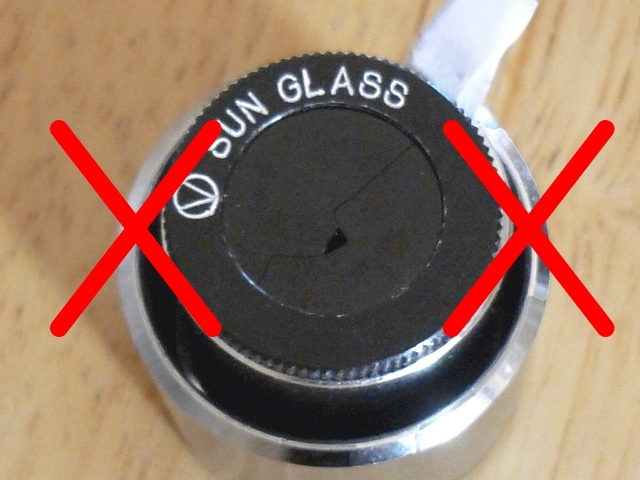 The main drawback of the welding glass is that if left unmounted, they are prone to breaking if dropped. 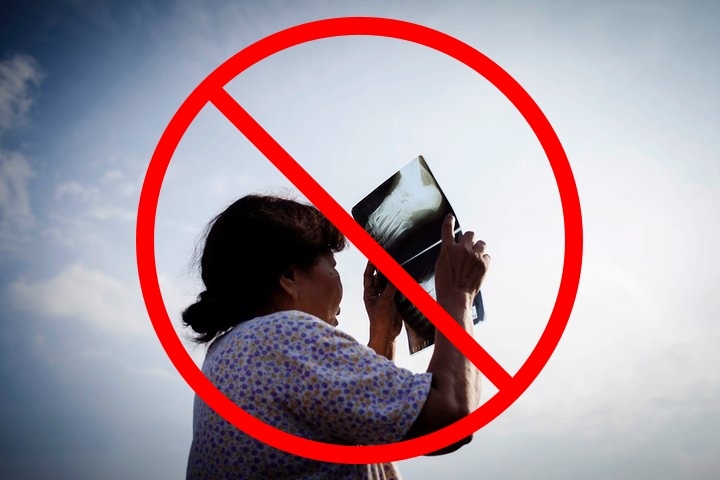 There are a couple of methods of observing the Sun that you must NEVER USE: viewing through smoked glass or exposed film. Both of these materials will not protect your eyes against the harmful ultraviolet and infrared light, causing permanent eye damage! Though many experienced solar eclipse viewers will tell you that the best way to witness an eclipse is just with solar glasses, some folks like to get a more close-up view of the action (until totality). Nowadays, numerous telescope, camera, and optics manufacturers produce solar filters made to fit on the ends of telescopes, binoculars, and cameras. 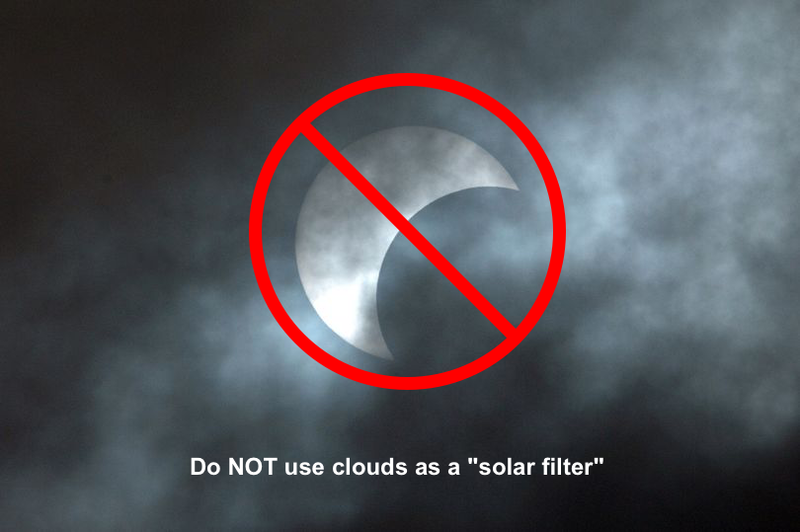 These filters, as all should, filter the sunlight to safe levels before it enters the observing aid or your eye. ONE OF THE MOST IMPORTANT THINGS TO KEEP IN MIND IS TO GET A FILTER MADE FOR YOUR EQUIPMENT – IMPROPERLY FIT FILTERS CAN LET IN UNFILTERED SUNLIGHT OR EVEN FALL OFF DURING OBSERVATION! A filter should have a snug fit on the end of the telescope, camera, or binocular – loose filters should be avoided or securely fastened so that there is no way they can accidentally fall off during viewing. 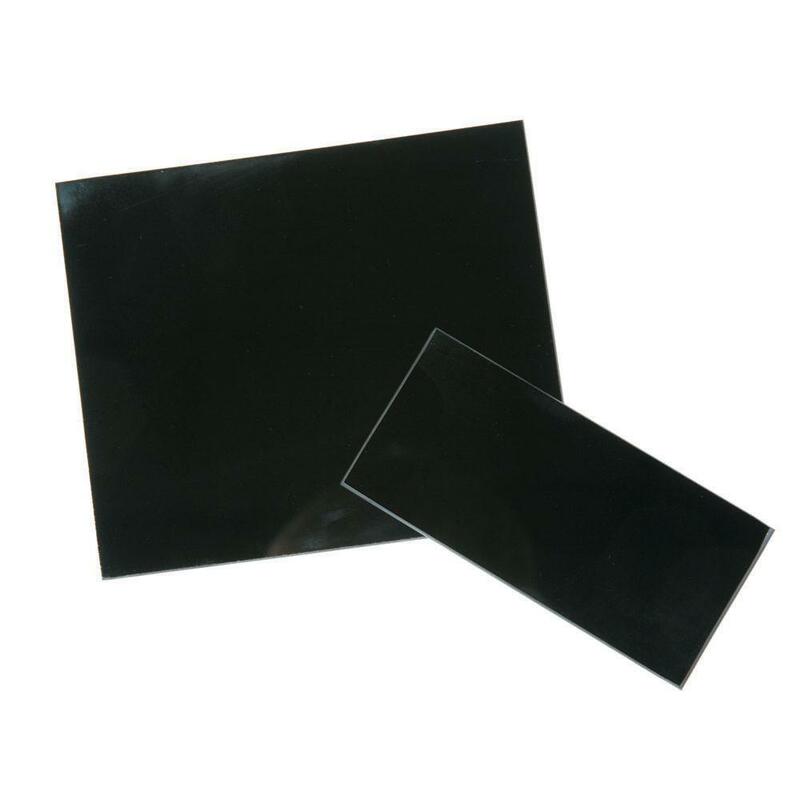 Solar filters for cameras and other observing aids come in two main forms – glass filters and mylar filters. Glass filters tend to be more expensive because of the manufacturing process but are specially made to fit most commercially made telescopes, binoculars, and even cameras. Like the black polymer solar glasses they typically give an orange view of the Sun. Mylar filters tend to be the cheaper (but still safe) alternative. The material can be made into large rolls (you can even buy rolls to make your own sets of solar glasses, telescope filters, etc.) and easily cut to produce numerous filters. The main requirement after that is to fasten the material in a sturdy support that will securely mount to the telescope or other observing aid. Baader AstroSolar Safety Film – Baader AstroSolar Safety Film sheets are available from Astro-physics.com. A couple of sizes are available. Note that if you are going to be using the film to a make a filter that your eye will look through (even if mounted on a telescope or binoculars) choose the “visual” film, NOT the photography film. 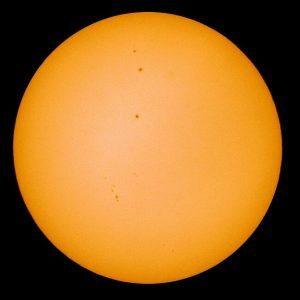 Solar Filter Tutorial – This site offers step-by-step directions on how to make a variety of solar filter cells for telescopes and binoculars. Also contains downloadable PDFs. 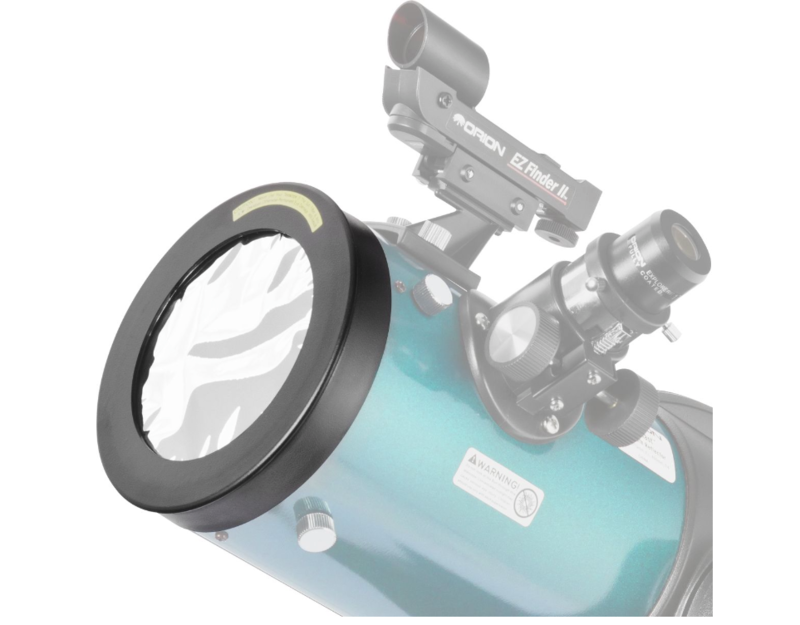 Orion Solar Filters – The Orion telescope company is a leader in observing equipment and carries an assortment of glass and mylar solar filters for a variety of products. 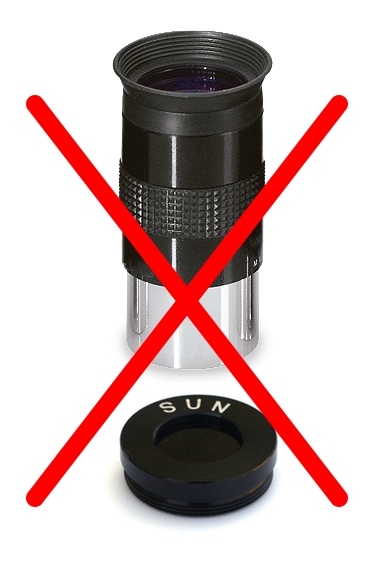 One type of filter you should NEVER USE is an eyepiece solar filter. 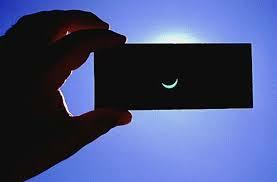 Eyepiece solar filters are often advertised as being a cheap way to view the Sun, which can sound very appealing. These filters literally screw onto the bottom of a telescope eyepiece and are intended to filter the incoming sunlight just before it enters the eyepiece. 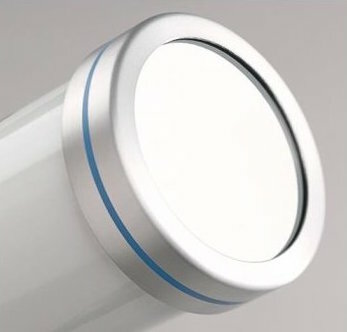 The issue is that the unfiltered sunlight collected by the telescope optics is focused onto the filter, and the intense heating of the filter that results will cause the filter to crack, letting through extremely high amounts of highly concentrated infrared, optical, and ultraviolet light. The best practice to follow when one finds an eyepiece solar filter is to TRASH IT! 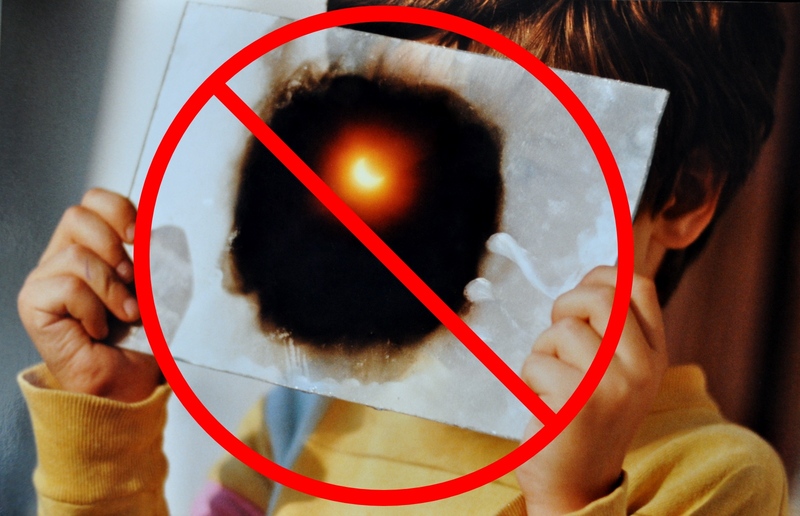 It is also possible to use a telescope without a solar filter to view the eclipse; however, one must be careful to ensure that no passers-by, especially children, are allowed near the eyepiece of an unfiltered telescope, and one might risk damage to his/her telescope if care is not taken. The method alluded to is a simple projection method. 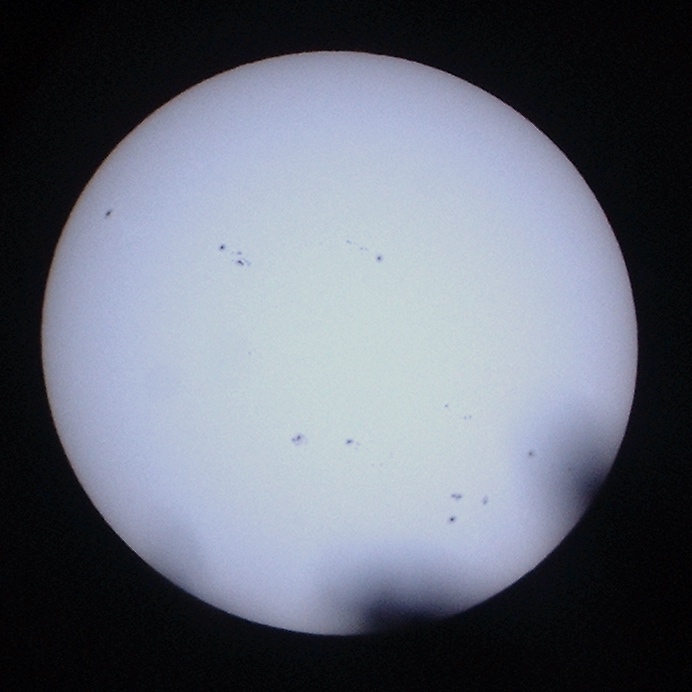 An unfiltered telescope is aimed at the Sun, and the resulting image is projected onto a screen mounted near the eyepiece. There are a few variations of this method, which are discussed below. NOTE: Damage to the telescope may result from this method. Unfiltered sunlight that is accidentally focused onto the structure of the telescope (usually due to lack of careful tracking) can damage/destroy parts of the telescope. In addition, eyepieces used in the projection method can crack under the thermal stress. If one intends to use the projection method, it is recommended that an inexpensive or already damaged eyepiece be used. The simple rear projection method just focuses the image of the Sun onto some sort of flat (usually white) surface that is mounted near the eyepiece. It is not recommended that one hold the projection screen – accidentally moving the screen out away from the focal point might allow unfiltered light to enter an observer’s eyes. A better method is to create a projection screen assembly that encloses the eyepiece, preventing any unfiltered light from accidentally entering unprotected eyes. Several popular designs have come about, including the “Sun Gun” and “Sun Funnel.” These assemblies consist of a cylindric or conic support that attach to an eyepiece and hold a rear-projection screen at the other end, which completely encloses the unfiltered sunlight. One of the advantages of image projection is that numerous people can view simultaneously. Building a Sun Funnel – A downloadable PDF tutorial with detailed step-by-step instructions on how to build a Sun Funnel projector for your telescope. Also includes details such as how to choose the appropriate eyepiece for your particular telescope. 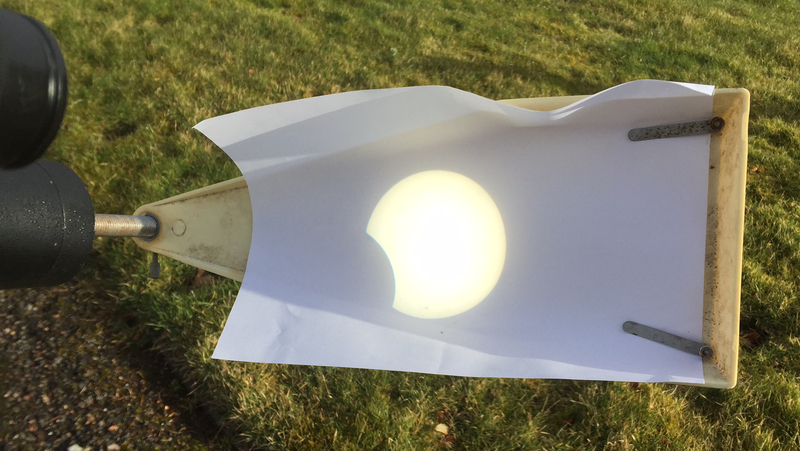 Finally, if you don’t want to spend the money for a solar filter or the inexpensive welding glasses and solar glasses are not available, then all is not lost! 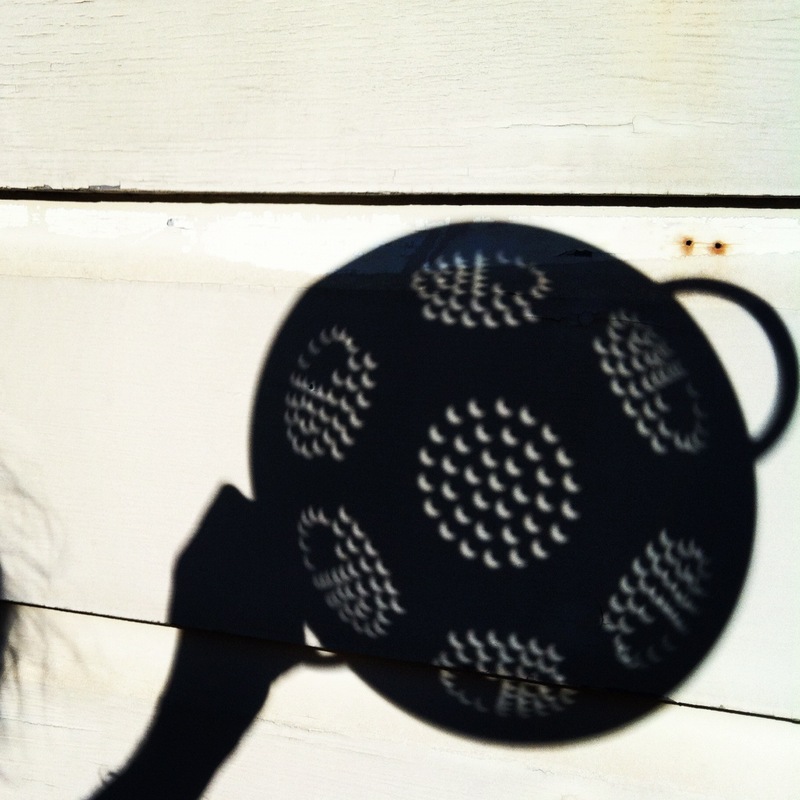 You can simply use materials found around the house to project the image of the partial eclipse. 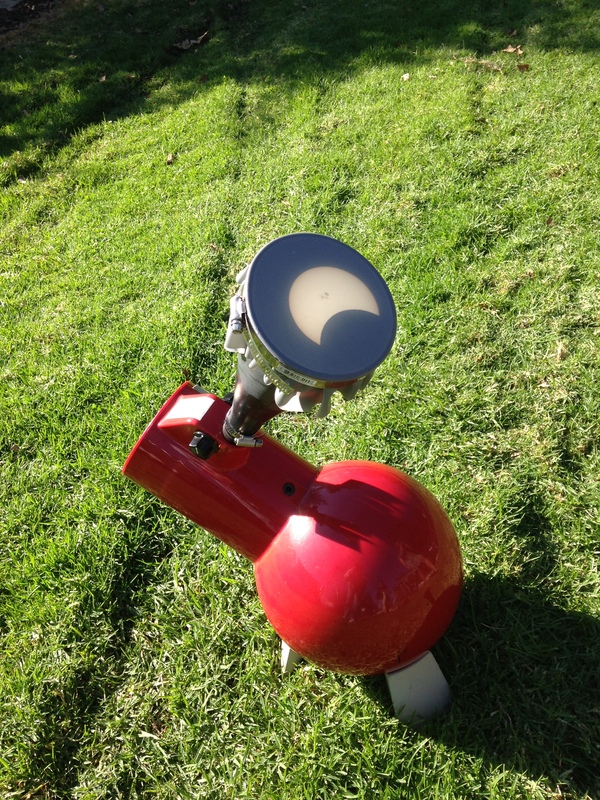 Pinhole projection is one of the easiest methods to observe a solar eclipse – the main drawback is that you typically don’t get a very large, sharp image. 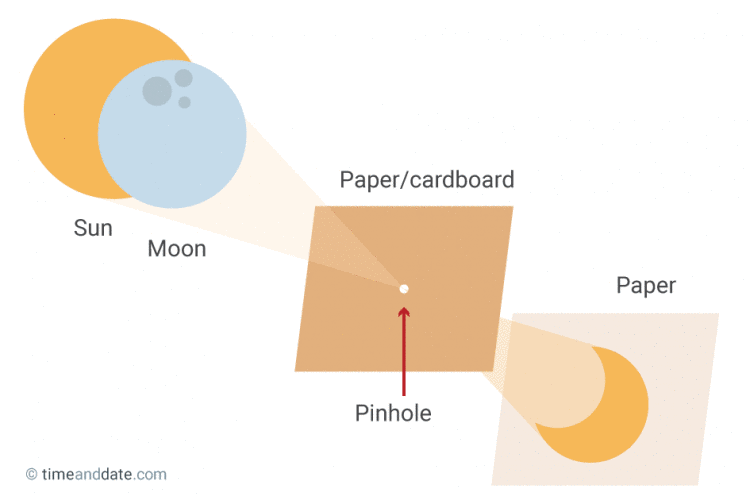 You can construct a pinhole viewer (a box with a very small opening at one end) or just use objects that already have a small hole. 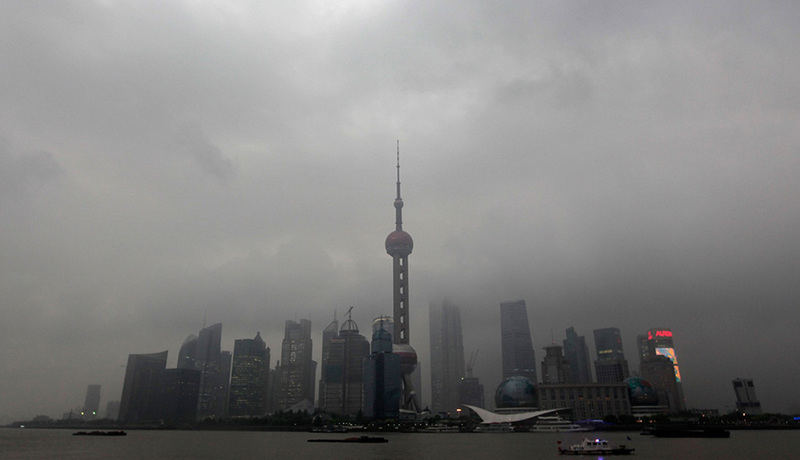 NOTE: The pinhole is used for projection onto a surface – DO NOT LOOK THROUGH THE PINHOLE! What happens if the total eclipse is clouded out? Even if clouds intervene during totality, disappointed observers will still be able to experience the umbra of the Moon. 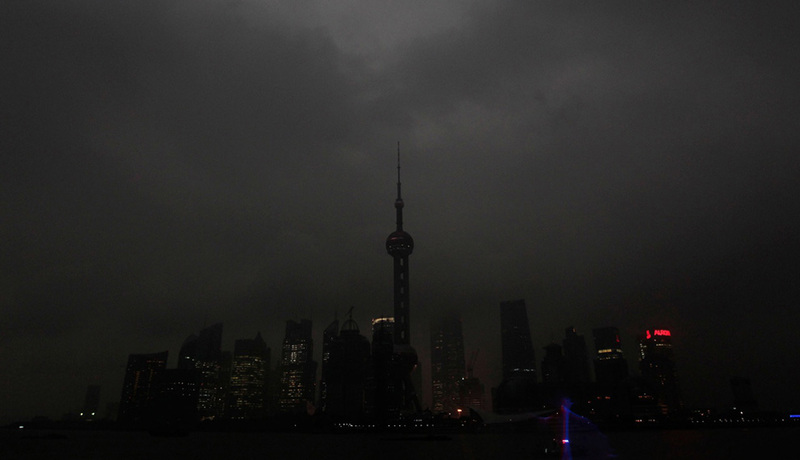 During totality, the amount of sunlight is diminished greatly, and clouded-out viewers will still be able to experience this darkness in the middle of the day.